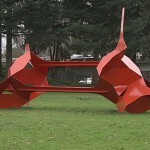 Bruce Beasley’s “Big Red,” the abstract steel sculpture which has sat in Washington-Jefferson Park between Sixth and Seventh Avenues since 1974, is a special feature of the City of Eugene’s landscape as well as the community’s culture. So while Occupy Eugene readied itself for the move from the Millrace to Washington-Jefferson Park, many of the activists understood the need to be proactive in paying respect to the landmark. Martin Truther, an Occupy Eugene participant, took the initiative to write Beasley to ask if Big Red could become a pillar of the community, both metaphorically and literally, as Occupy Eugene’s Engineering Committee had tossed around ideas of using Big Red’s central spire to support a tarpaulin. Truther explained how Occupy Eugene planned to protect the sculpture from damage using carpet and recycled tires to act as a buffer. Occupy Eugene was delighted when they received a response from Beasley that he was “pleased and honored to have Big Red be a part of [Occupy Eugene].” He added that it would be all the better “if she acts as some kind of guardian angel,” and that photos and videos of Big Red’s participation in Occupy Eugene would be much appreciated. Truther was even invited to Beasley’s sculpture garden in Oakland, CA, and the two were able to meet this past weekend to discuss everything from Big Red’s role in Occupy Eugene, to the state of Occupy Oakland in marked contrast to Occupy Eugene, as well as some of Beasley’s own history in social activism. “He’s an inspiring guy,” says Truther of Beasley. So far, plans to integrate Big Red into the structure of the camp have been unnecessary, but the sculpture is a main focal point in the occupation and one that is regarded with much adoration and appreciation by the occupiers. A few days ago a sign sitting next to the sculpture read: “I’m With Them.” Occupy Eugene was also careful to build the occupation in such a way that the rest of the Eugene community’s view of Big Red isn’t obstructed. With Bruce Beasley and Big Red’s enthusiastic participation, gracious cooperation from the Eugene Police Department, and the City Council’s decision on November 9 to exempt Occupy Eugene from a camping ban in Washington-Jefferson Park, Occupy Eugene is continually humbled by the amount of support the community has shown. Occupy Eugene and the broader Eugene community have created a model for a cooperative, productive relationship that can be used by other cities and occupations around the country, something the entire community can be proud of.